The sun came out yesterday, which meant I was running about like mad yet again, trying to shoot as much as I could before it rained on me, I had come to expect it. It did not in fact rain on me this time. Not to say it all went smoothly, two of my locations were unavailable. One was a temporary film set, the other scene was full of cop car bumper, cop monitoring the film set. After hours of shooting and doing work, legs killing, stomach empty, I met up with Brent for the best roti from Gandhi Roti. 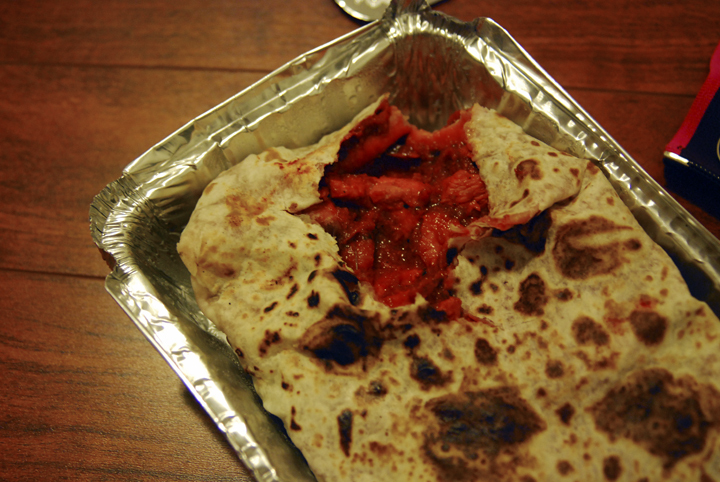 As I pictured it, I thought roti was a small tiny piece of naan bread wrapped around some saucy meat. What I got instead was a giant piece of thin naan bread, filled to the bursting point with chicken tikka masala (I changed my mind from the usual go-to of butter chicken). Being adventurous, I ordered hot. And it was hot. My eyes started watering, my throat burning. Thankfully I had the previously mentioned Irn Bru to down it with. It was insanely too big for one person to eat. I got halfway through eating it, well ripping off pieces of it, no way could I hold it and bite into it. (My hands still smell like curry). 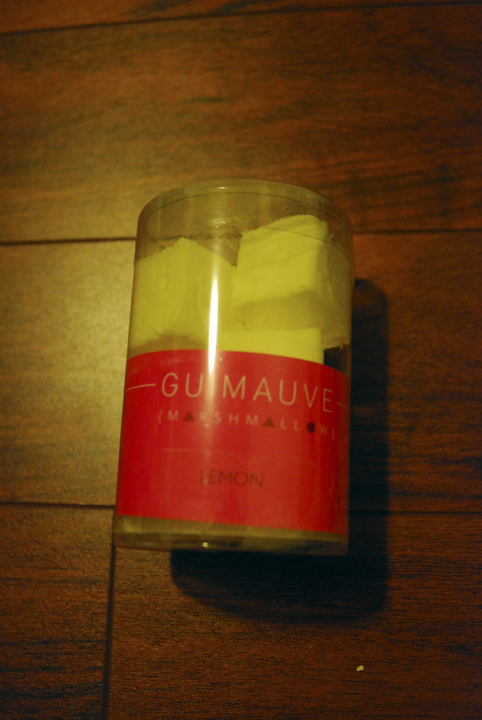 For dessert we had marshmallows from Nadege (voted the best by Toronto Life). They were delicious, very light & fluffy and not ungodly sweet. They were lemon flavoured but I admit it the flavour was a tiny bit fake, but not that noticeable. As if that was not enough, we also gorged on some candy I had bought from Sugar Mountain. I went in there looking for Irn Bru and walked out with chocoalte covered: cookie dough, caramel popcorn and gummy bears. A delicous feast to go with huilarious Halloween television (NBCs comedy Thursday). As mentioned before, Brent was in Scotland for a bit. He is back now. And he did not arrive alone. He had in tow, a giant sack of candy for me!! Thankfully I had 4 other people to share my riches with. 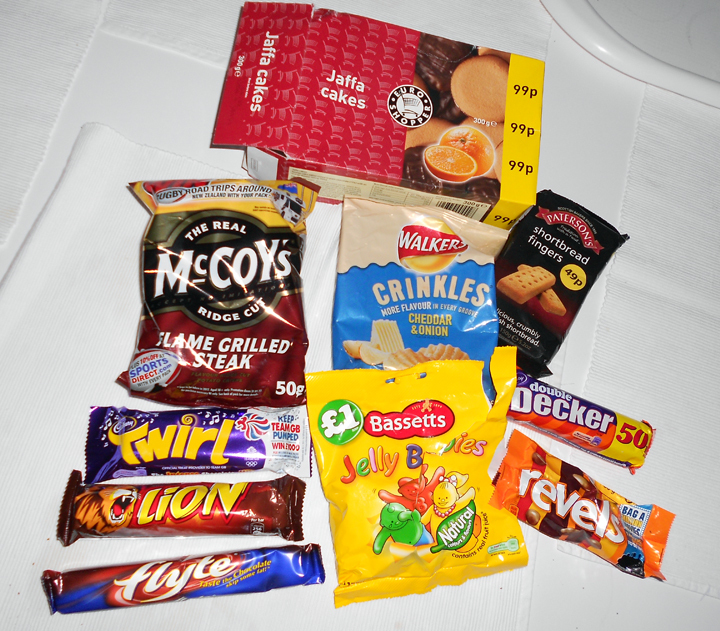 He brought me an assortment of chocolate bars, some potato chips, sorry… crisps, cookies and shortbread. Oh and Jelly Babies. Rather than ration my stash, I dove in and pigged out. The prime rib chips, sorry again, crisps, were kind of weird. It was like chips seasoned with Vegeta. The Sour Cream & Cheddar were much better, it was like onion rings crossed with cheesies, it was as if two snacks in one. The Jelly Babies did not look appetizing, they were covered in a weird powder. They looked like jujubes, but when you bit into it, it was like a chewy gummy. Hands down the greatest chocolate bar was the Double Decker. It was like a Whatchamacallit with marshmallow whip on top. Simply divine it was. The other chocolate bars were just pretty much the same as we have here, Aero and Mr. Big. The Jaffa cakes were just like Delicje, except with a smaller jelly top. Brent did not bring soda, but he has gotten his friends who stay behind for a few extra days to bring me some. He was raving about it so much, I just had to see what all the fuss was about. 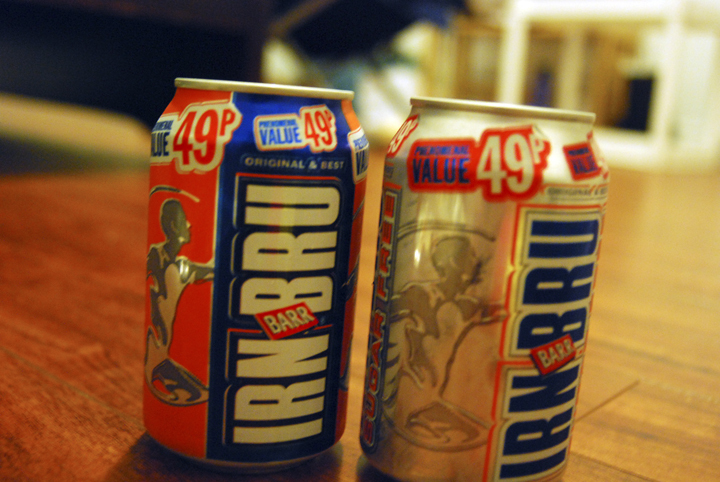 I went out, did a bit of googling and found a shop in Toronto that sells Irn Bru. And this was the good kind, bottled in Scotland. It tasted like cream soda crossed with bubblegum. I really wish I had more, but man was it ever expensive. Too expensive to be addictive, at least for now. Ditto on Double Decker. Fabio and I met up yesterday for we had both been craving pancakes for some time now. Pancakes were sounding real nice right about then given I was manically running around the city trying to photograph as much as I could before it (inevitably) rained on me. I say inevitably because every time I have gone out to shoot for this one project (at least 3 times) it ended with rain. And like clockwork, it rained. At least it was at the end of my shoot. For pancakes it was decided we would go to Mitzi’s on College because they have the best pancakes. We got there, went in and it was rather empty, not too odd given it was a Tuesday afternoon. Then the waitress told us that they were closing. Damn it all. Hungry, rain-soaked and craving pancakes we set off along College. I decided that crepes were the next best thing. And wouldn’t you know it, we were only a few blocks away from I Feel Like Crepe. Almost half a year later, but I finally got to go there! Honestly, it was nothing outstanding. The place was pretty much deserted so the service was fast. It was also rather dark in there, not so great for the table-top food photography. 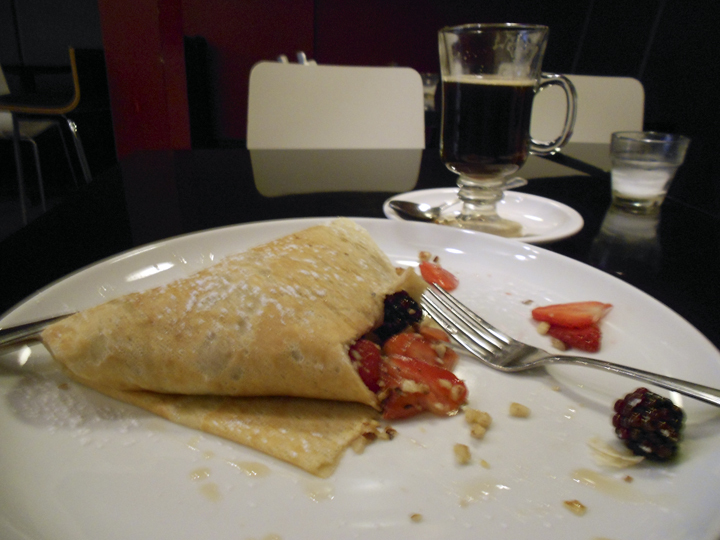 The crepe I ordered had mixed berries and maple syrup and crushed hazelnuts in it. 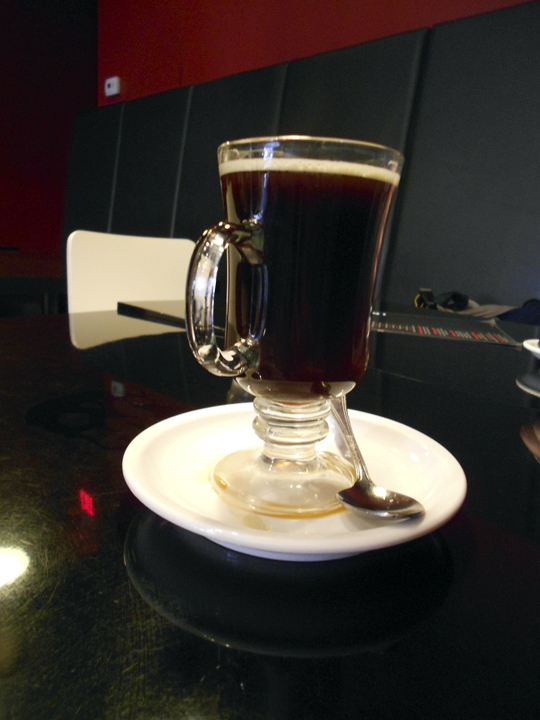 It was delicious and reasonably priced, it went well with the Monte Cristo coffee I ordered (I was curious about it since in Shrek 2 when the fairy godmother orders one). As I was cutting off a piece, having started at the wide end (it was folded like a triangle), some blueberries popped out the narrow-end opening. 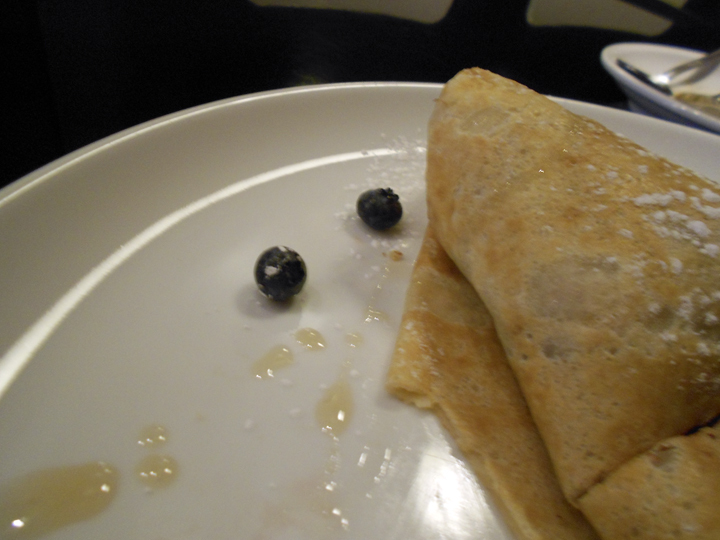 I burst out laughing, it was as if my crepe had pooped out blueberries. One thing that caught my attention (and the little feminist inside of me’s attention): the menu. 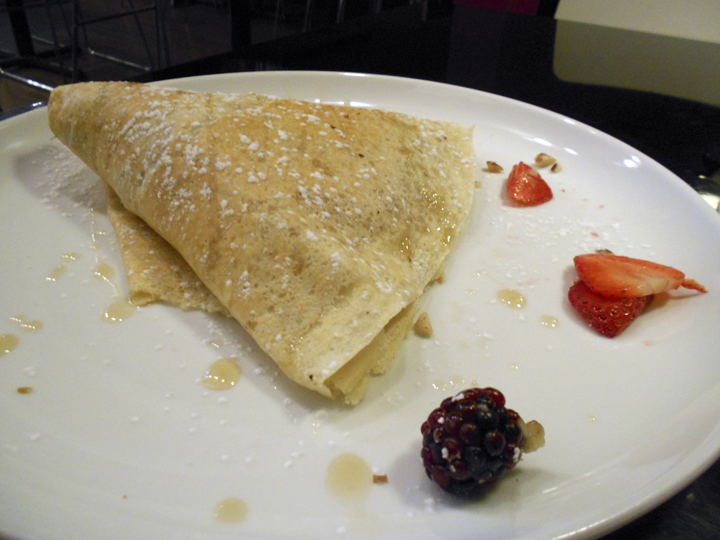 The savoury crepes (meats, cheeses, veggies etc…) all had male names while the sweet crepes (fruit, nutella, ice cream etc…) all had female names. Some mild and very weird sexism at hand? Why would you give crepes people names anyways?! AHAHAHAHAHHAHA! That’s what I get for blogging for 7 years? The previous post about TV shows, well in it I totally forgot to mention the dilemma that set the whole thing off (it was more than just boredom). Some of my dear shows are coming to an end and thus I have a spot to fill with more shows. And of course the spare time to fill as well. The IT Crowd is no longer going to have one last season, it has been canned. Breaking Bad will be going into it’s last season as well. United States of Tara was only 3 seasons long, and I finished it last night (so good!). What to do? On Friday, Camilla and I chanced upon the brilliant idea to browse TV shows at HMV. We wrote down the titles of what peaked our interest and then I scurried home to get them from the library. Alas there are only a few shows, and for almost all of them it is going to be a while before I am up in the queue. The ones I did get on hold: Nurse Jackie, Mad Men, Big Love, Damages and Torchwood. That is barely even half of the list we had come up with! Torchwood is up first, it should be here soon. It turns out that the one summer when Brent and I had watched it, there was more to it! He had told me his co-worker recommended the show as a mini-series. So we watched, and it was good. But now it turns out that we had watched season 3. And then there were still 2 TV-movies of it as well. The library only has season 1 in their collection and I am not a big enough fan to go out and buy it. I got hooked on Boardwalk Empire after receiving a free promo copy of the pilot episode. And all for nothing because I have no way to continue watching it! Oh the agony! It looks like for now all I have is my one Simpsons Halloween DVD, at least until Tuesday by when hopefully *fingers crossed* Torchwood will be in. YogenFruz is disgusting. I am sorry to say, but man did I piss away my money on that crap. It was too rich and too much like ice cream crossed with pudding. I was expecting a nice light snack. Not some horrid dense thing that occasionally had ice crystals in it. No thank you, never ever again. Only Yogurt Spoon for me.